I finally found the weekly family calendar that I have been looking for. 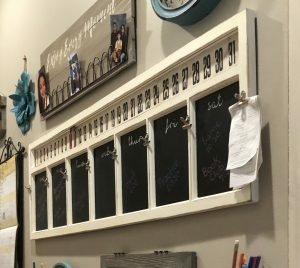 I use one of the Mom’s calendars for planning further out, and I love it, but I need a larger and more prominent calendar to plan out our weeks. 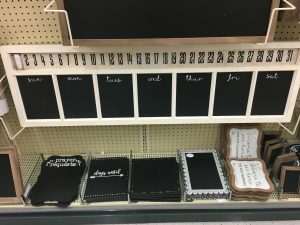 When I saw this at Hobby Lobby I knew it was the one. Even though I really like this one, it was missing a couple of things. First I sometimes need to keep track of papers which have to be returned to school on particular days or items that needs to be mailed on a specific date. To help with that, I attached Bulldog clips between each day. Bulldog clips were more difficult to find than I had expected, but you can order them from Amazon by clicking on the linked products below. Disclaimer: We are a participant in the Amazon Services LLC Associates Program, an affiliate advertising program designed to provide a means for us to earn fees by linking to Amazon.com and affiliated sites. This program results in no added costs for you. Silver Bulldog Clip (I used this color) or if you prefer a Rustic Bronze Bulldog Clip . I tried attaching the Bulldog Clips with hot glue, but that was a total fail. You can let my failure be your time-save and skip the glue. After the epic failure of the glue, I attached the bulldog clips with screws. A much better option. Next, I purchased liquid chalk markers and gave each person their own color. Liquid Chalk Markers can be purchased from Amazon using the following link: Liquid Chalk Markers . that I use for plans for the entire family. And lastly, I have chalk pencils to match the liquid chalk markers for each person. The colored chalk pencils can be found here: Colored Chalk Pencil . I use the liquid chalk for reoccurring events – like practices and I use the chalk pencils for events which do not happen at the same day/time each week – like games, school assignments, and appointments. I have two options for each color is because the events written with liquid chalk will not be disturbed when using a dry eraser to remove the non-reoccurring events. The liquid chalk must be removed with a damp cloth but the chalk pencils can be removed with a dry eraser or even a dry papertowel. This leaves the reoccurring events in-tack when changing out the weekly events. The final customization made to the event calendar was to add a Driftwood pickling wash to the edges of the wood. This wash was added so that the Event Calendar and the Menu Board coordinate. (I wish I had realized I needed to add the pickling before adding the bulldog clips, but at the time I added the clips, I had not yet found what has become our family menu. Please click here for steps to use a pickling wash. To check out our Family Menu Board, please click here.